1. Stay Positive. You can listen to the cynics and doubters and believe that success is impossible or you can trust that with faith and an optimistic attitude all things are possible. 2. Take a daily "Thank You Walk." You can’t be stressed and thankful at the same time. Feel blessed and you won’t be stressed. 3. Eat more foods that grow on trees and plants and less foods manufactured in plants. 4. Talk to yourself instead of listen to yourself. Instead of listening to your complaints, fears and doubts, talk to yourself with words of truth and encouragement. 5. Post a sign that says "No Energy Vampires Allowed." Gandhi said, "I will not let anyone walk through my mind with their dirty feet." Watch This. 6. 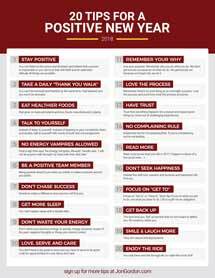 Be a Positive Team Member. Being positive doesn’t just make you better, it makes everyone around you better. 8. Get more sleep. You can't replace sleep with a double latte. 9. Don't waste your precious energy on gossip, energy vampires, issues of the past, negative thoughts or things you cannot control. 10. Look for opportunities to Love, Serve and Care. You don’t have to be great to serve but you have to serve to be great. 11. Live your purpose. Remember why you do what you do. We don't get burned out because of what we do. We get burned out because we forget why we do it. 12. Remember, there's no such thing as an overnight success. Love the process and you’ll love what the process produces. 13. Trust that everything happens for a reason and expect good things to come out of challenging experiences. 14. Implement the No Complaining Rule. If you are complaining, you're not leading. 16. Don't seek happiness. Instead live with love, passion and purpose and happiness will find you. 17. Focus on "Get to" vs "Have to." Each day focus on what you get to do, not what you have to do. Life is a gift not an obligation. 18. The next time you "fail" remember that it’s not meant to define you. It’s meant to refine you. How will you make 2018 more positive? Share with me on Facebook, or Twitter. Make 2018 Your Best Year Yet! Free Access Online Now. What's Your One Word for 2018? Each year I pick a word for the New Year that will inspire me to be my best. 9 out of 10 people will fail with their resolutions but One Word sticks. No goals. No resolutions. 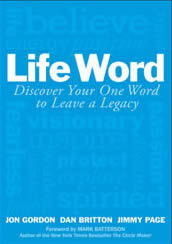 Just One Word that helps you write and create a yearly chapter in your life story. It's powerful. 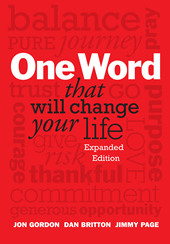 Read more about the power of One Word here. When you know your words I would love to hear them. One of my favorite things is to hear people's words and why they chose them. You can share your words with me and others on Twitter or Facebook.